Noticing your cat is losing a large amount of hair can be quite alarming, but there are many reasons for hair loss in cats. Some, such as fleas, are easy to treat; others require the help of a veterinarian. Either way, learning about the causes can help you get your cat the help he needs. Hair loss, also known as alopecia, is generally caused by one of the following disorders. As the most common disorder that felines experience, hyperthyroidism is also the leading cause of feline hair loss. Other symptoms of hyperthyroidism include weight loss, a curb or complete standstill in grooming, excessive thirst and urination, and insatiable appetite. Luckily, in most cases, hyperthyroidism can be easily controlled with medication or radioactive iodine therapy. A rare condition in cats, hypothyroidism causes the thyroid gland to produce inadequate levels of thyroid hormones to maintain a normal metabolism. The condition causes hair loss, as well of a host of other symptoms that include weakness, weight gain, and lethargy. Flea allergy dermatitis can lead to hair loss. A cat's focus becomes scratching to relieve the intense itching. The animal will go to any lengths to reach the agitated skin, including biting off hair in the bothersome areas. 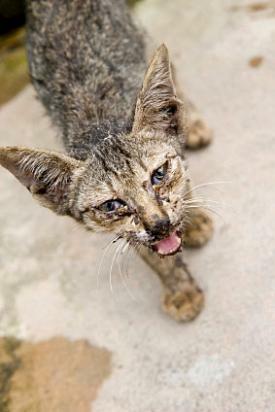 Cats with fleas should be treated immediately to avoid further, more serious complications to their overall health. Hair loss and itching are common symptoms when a cat has an allergic reaction to something it has eaten or come into contact with in the environment. Tracking down the cause of the allergy is the most difficult part of diagnosing the problem. Once the allergen has been identified, treatment usually involves eliminating the substance from the cat's diet or environment. As the allergen works its way out of a cat's system, itchy rashes begin to fade away. A vet may also prescribe medication to relieve the worst of the itching. Once the system returns to normal, most cats will regrow their fur. Pyoderma is a bacterial infection that commonly sets in when the skin is traumatized from scratching and biting. The infection produces localized hair loss as well as a pus discharge that crusts over the lesions. Great care must be taken to clean away the discharge to promote healing, but since pyoderma is a secondary infection, it's still crucial to determine the cause of the irritation. Mange mites burrow under the skin and can cause extreme itching even though they can't be seen. Mange is typically diagnosed via skin scrapings viewed under a microscope. Treatment usually involves application of a pyrethrin product under veterinary supervision. Ringworm is actually a fungal infection that produces circular patches of hair loss as the fungus infests the hair shafts. 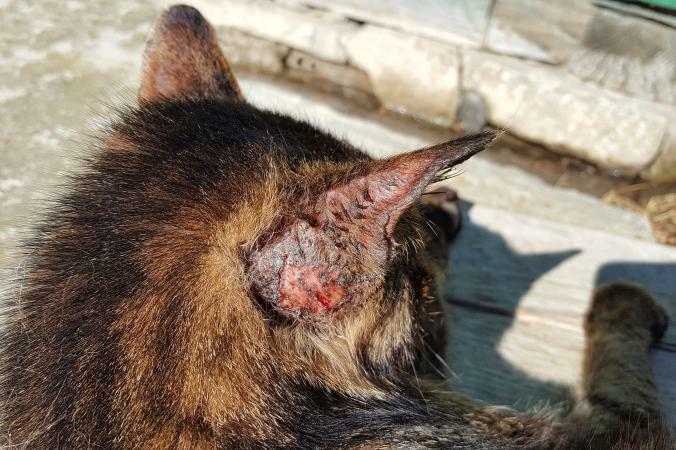 It is generally treated with various dips or oral medications, but some vets also recommend shaving the infected cat to remove the fungus completely. Once the ringworm fungus is gone, the hair should regrow. In some cases, hair loss in cats can be brought on by other lesser-known causes such as notoedres cati, more commonly referred to as notoedric mange. 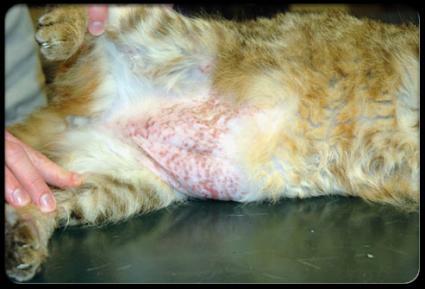 This is a parasite that causes alopecia in cats. Hair loss from notoedres cati is seen on the ears, neck, eyelids and other facial and upper body regions. 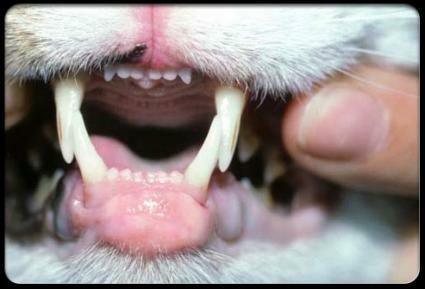 While most people have never heard of notoedres cati, it is the second most common parasite in cats. Cushing's disease, also known as hyperadrenocorticism, is a far less common cause of hair loss. Other symptoms that will occur concomitantly are an increased appetite and thirst as well as mild to severe lethargy. You may notice that your cat's skin seems thin, or the petting your cat once enjoyed may now agitate it. The hair loss associated with Cushing's disease is bilateral, meaning what is missing on one side of the animal's body will be almost exactly the same as what is missing on the other. Generally, this hair loss is located on the mid to lower abdomen, but it can technically occur anywhere on the body. Unlike true alopecia which leads to hair loss, congenital hypotrichosis only causes hair thinning. According to ProVet Health Care, this genetic condition typically affects Birman, Burmese, Siamese and Devon Rex cats. 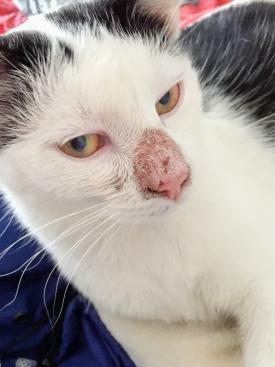 The exact cause of eosinophilic granuloma is not known, but veterinarians speculate that it could be related to an underlying allergy. This condition typically causes irritating lesions that cause hair loss on the back of the thighs. Feline endocrine alopecia is actually a rather rare condition characterized by hair loss on the abdomen, inner legs and genital region. The exact cause of the condition is not currently know, but it's believed to be linked to hormone levels. 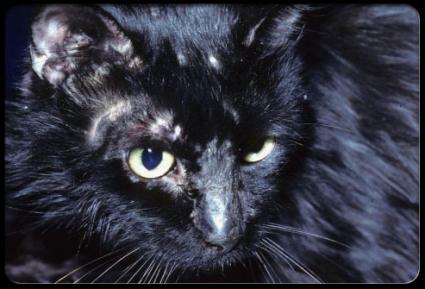 Psychogenic alopecia is a compulsive disorder that drives a cat to groom itself obsessively. Excessive licking and chewing leads to hair loss, and some cats will even pull out their own hair. A vet will only arrive at this diagnosis if all other underlying conditions can be ruled out. Although there are some causes of hair loss that you have little control over, there are a few things you can do to at home to help make sure your cat's skin and fur remain healthy. The best way to avoid hair loss caused by food allergies or a poor diet is to feed your cat a healthy food from the onset. Choose foods high in protein where the first ingredient is meat, preferably salmon or turkey. Other meats, such as beef or even chicken, may not provide your cat with all the necessary nutrients. The best foods will have the most digestible ingredients for maintaining cat health. Turkey and salmon are both considered meats a cat would eat without human intervention, and both offer the most digestible proteins for felines. Some veterinarians warn that fish-based foods can lead to hyperthyroidism; however, this is generally only the case with very low end foods. To avoid this disorder, augment your cat's diet with a Vitamin E and Vitamin B supplement. If you allow your cats to enjoy the outdoors, be sure they are up to date with all vaccinations. Not only will this keep them from experiencing any preventable illnesses that could lead to hair loss, vaccinations will also stave off much more serious and possibly fatal diseases. For your outdoor cat, use a preventative treatment that protects against all parasites including fleas, mites, heartworms, ringworm and ticks. Be sure that any preventative you use is specifically formulated for cats. The information presented here is not meant to replace professional veterinary diagnosis and treatment. If your cat displays any symptoms of hair loss, ask your vet to examine your pet to get a proper diagnosis and treatment plan. 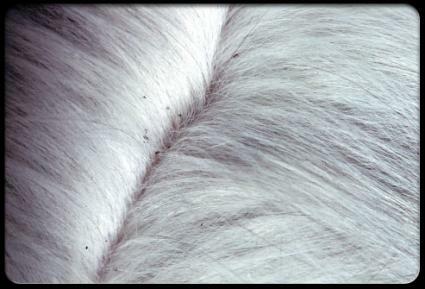 Remember, your cat's fur protects its skin, so fur loss can become a serious problem if left untreated.